A new study offers not only a sweeping analysis of how pollination has evolved among conifers, but also an illustration of how evolution -- far from being a straight-ahead march of progress -- sometimes allows for long-standing and advantageous functions to become irrevocably lost. Moreover, the authors show that the ongoing breakdown of the successful, but ultimately fragile, pollination mechanism may have led to a new diversity of traits and functions. Dr. Andrew Leslie, Assistant Professor of Ecology and Evolutionary Biology at Brown Univesity, and his co-authors studied more than 460 conifer species to order and trace the evolution of a trio of traits that provide an ancient function of pollination. Many pine and spruce species still exhibit these attributes: pollen grains that are buoyant because of structures called sacci (air-filled bladders), downward facing ovules, and the well-timed emission of a drop of liquid. For a few days a year, these trees send their pollen into the wind. The pollen grains that lands on the cone under the ovule becomes engulfed in the droplet and, because the pollen grains are buoyant, float up into the ovule. The process has the advantages of filtering out non-bouyant particles, and of guiding a concentration of pollen saccae to the otherwise well-shielded ovule. "People thought these traits were correlated," said Dr. Leslie, first author of the paper that was published online on April 22, 2015 in the journal Evolution. "What we did was put this in an evolutionary context." The article is titled “Trait integration and Macroevolutionary Patterns in the Pollination Biology of Conifers.” What the scientists found is that while the mechanism had apparently served the wide world of conifers well for hundreds of millions of years, it is gradually disappearing. Researchers from Ludwig-Maximilians-Universitaet (LMU) in Munich, Germany have demonstrated, for the first time, that bacteriophages (bacterial viruses) carry genetic instructions for proteins that mediate the transport of their DNA to specialized replication sites in the host cell. Viruses are essentially inert nucleoprotein particles that come alive only when they find the right host cells, on which they depend for their reproduction. 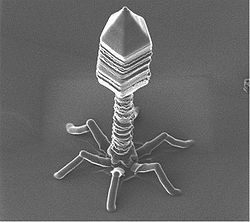 Bacteriophages (or “phages” for short) are viruses that infect bacteria. Work carried out by researchers led by Dr. Marc Bramkamp, who is Professor of Microbiology at LMU, and Professor Julia Frunzke at the Jülich Research Center now shows that some bacteriophages deliver certain proteins required for optimal replication of their own genomes to host cells that do not themselves possess them. The new findings were published online on April 27, 2015 in an open-access article in Nucleic Acids Research. The article is titled “A Prophage-Encoded Actin-Like Protein Required for Efficient Viral DNA Replication in Bacteria." “In order to replicate their own hereditary material, viruses must ensure that it reaches the sites of DNA replication that are normally utilized by the host and the correct egress sites where the viruses leave the host. We have now shown, for the first time, how a so-called prophage (a viral DNA that has been integrated into the genome of its host during a prior infection) organizes its own transport to such a replication site when induced to self-excise from the bacterial chromosome,” Dr. Bramkamp explains. Viruses that infect the nucleated cells of higher organisms (eukaryotes) often exploit the so-called actin cytoskeleton, a complex system of metastable fiber-like structures (filaments) for this purpose. University of Texas (UT) Southwestern Medical Center scientists have discovered that a certain class of receptors that inhibit the immune response are crucial for the development of acute myeloid leukemia (AML), the most common acute leukemia affecting adults. The researchers found that some receptors containing the immunoreceptor tyrosine-based inhibition motif (ITIM) are important to the development of AML, providing a new target for potential therapies. “We showed that these receptors are expressed by AML cells and that they support the development of AML. Although counterintuitive, this result is consistent with the generally immune-suppressive, and thus tumor-promoting, roles of inhibitory receptors in the immune system,” said Dr. Chengcheng “Alec” Zhang, Associate Professor of Physiology and Developmental Biology, and a member of the Harold C. Simmons Comprehensive Cancer Center at UT Southwestern. “These findings suggest that blocking ITIM-receptor signaling, in combination with conventional therapies, may represent a novel strategy for AML treatment.” AML is a type of blood and bone marrow cancer in which certain stem cells or progenitor cells fail to properly mature into healthy white blood cells and, instead, become abnormal red cells, called leukemia cells, according to the National Cancer Institute (NCI), part of the National Institutes of Health (NIH). Leukemia cells can build up in the bone marrow and blood so there is less room for healthy white blood cells, red blood cells, and platelets, which can result in infections, anemia, or bleeding. Leukemia cells also can spread outside the blood to other parts of the body, including the central nervous system, skin, and gums, according to the NCI. Closing Ceremony of 2015 Annual Meeting of the International Society for Extracellular Vesicles (ISEV) Features Awards, Research Summary, Clinical Summary, and On to Rotterdam in 2016! At the end of Dr. Gary Ruvkun’s plenary address, Dr. Jan Lötvall, President of the International Society for Extracellular Vesicles (ISEV) (http://www.isevmeeting.org/), stepped forward to chair the closing ceremony of this “exciting and most interesting” 2015 annual ISEV meeting. First, Dr. Lötvall introduced Andy Hill, Ph.D., Professor and Department Head at the La Trobe Institute for Molecular Sciences at La Trobe University in Melbourne, Australia, to present a “wrap-up” of the scientific research presented at the meeting. Dr. Hill highlighted a number of areas of keen interest. These included EV biogenesis, isolation and characterization of EVs/exosomes, vesicle labeling, imaging (including super-resolution, confocal, intravital, and EM microscopy), nomenclature, and transcriptomics/RNA analysis. He also emphasized the great success of this year’s newly added “Meet the Experts” sessions. Next, Dr. Lötvall introduced Louise Laurent, M.D., Ph.D., an Assistant Professor, an obstetrician specializing in high-risk pregnancies, and a prominent EV researcher from the University of California, San Diego (UCSD), to give a wrap-up of the meeting from a clinical perspective. Dr. Laurent began by outlining where we are today, which she said is at the stage of discovering biomarkers and determining mechanisms, and where we are going in the future, which she said is in the direction of identifying druggable targets that might be EV-based and enable further development of personalized medicine. She emphasized that clinical progress in this area will depend critically on collaborations and cross-talk to speed advances. Communication needs to be “reciprocal,” she said, not “sequential.” Dr. Laurent also highlighted the needs for increased standardization and concern for reproducibility. On Sunday, April 26, the final day of the 2015 Annual Meeting of the International Society for Extracellular Vesicles (ISEV) (http://www.isevmeeting.org/), with a special focus on exosomes, the 800+ attendees were privileged to hear a plenary address from one of the world’s foremost authorities on small RNAs and RNA interference (RNAi), Gary Ruvkun (photo), Ph.D. Dr. Ruvkun is a molecular biologist at Massachusetts General Hospital and Professor of Genetics at Harvard Medical School. Dr. Ruvkun discovered the mechanism by which lin-4, the first microRNA (miRNA) discovered by Dr. Victor Ambros, regulates the translation of target messenger RNAs via imperfect base-pairing to those targets, and also discovered the second miRNA, let-7, and demonstrated that it is conserved across animal phylogeny, including in humans. These miRNA discoveries revealed a new world of RNA regulation at an unprecedented small size scale, and the mechanism of that regulation. Dr. Ruvkun has also discovered many features of insulin-like signaling in the regulation of aging and metabolism. Given that the cargo of exosomes and other extracellular vesicles frequently includes varieties of small RNAs, particularly miRNAs, Dr. Ruvkun’s world-class expertise in the field of small RNAs was particularly relevant to this ISEV audience. The winner of numerous prestigious science awards throughout his career, Dr. Ruvkun most recently was named a recipient of the 2015 “Breakthrough Prize in Life Sciences” (shared with Dr. Victor Ambros) for “the discovery of a new world of genetic regulation by microRNAs, a class of tiny RNA molecules that inhibit translation or destabilize complementary mRNA targets.” Dr. Ruvkun was warmly introduced to the crowd by brief remarks from Dr. Ken Witwer, Dr. Andrew Hill, and Dr. The final day of the International Society for Extracellular Vesicles (ISEV) (http://www.isevmeeting.org/) 2015 Annual Meeting in Washington, DC, kicked off with three of the newly-added and highly popular “Meet the Experts” sessions in which world-class experts in a particular area give brief presentations and then interact extensively with the audience in a Q & A session. One of these Sunday sessions was entitled “EVs As Diagnostics and Prognostics,” and was chaired by Fred Hochberg (photo), M.D., a world-renowned expert on glioblastoma, Associate Professor of Neurology at Harvard Medical School, and Attending Neurologist at Massachusetts General Hospital. The two speakers were Clark Chen, M.D., Ph.D., a neurosurgeon/researcher who is the Chief of Stereotactic and Radiosurgery and Director of Medical Education at the University of California, San Diego (UCSD); and Lorraine O’Driscoll, Ph.D., who is Director of Research and Associate Professor of Pharmacology, School of Pharmacy & Pharmaceutical Sciences, at Trinity College Dublin in Ireland. In his brief introduction, Dr. Hochberg emphasized the significance of identifying biomarkers for brain tumors, noting that there are currently four known types of glioblastoma, but it would be “hugely valuable” to have biomarkers that would allow physicians to know the specific subtype as quickly as possible in the disease course. He then introduced Dr. Chen, who he said had a particularly beneficial dual expertise in that he was both a neurosurgeon and a research scientist. The title of Dr. Chen’s brief talk was “Promises and Pitfalls of EVs As a Glioblastoma Liquid Biopsy.” Dr. Chen began by describing the rapid lethality of glioblastoma (GB) and the “opacity of the disease.” Presently, there is no treatment for GB and it is generally fatal within 14 months. Saturday’s session of the 2015 Annual Meeting of the International Society for Extracellular Vesicles (ISEV) (http://www.isevmeeting.org/), April 23-26 in Washington, DC, opened with three early-morning “Meet the Experts” sessions. These highly valuable sessions offer any of the 800-plus meeting attendees the opportunity to both hear the background and latest news in a particular research area, as delivered by world leaders in that area, but then also to ask questions of these experts. These sessions typically provide a tremendous source of information exchange on key advancing areas in exosome research. One of the three sessions was entitled “Bacterial and Parasite EVs,” and offered exciting information from two of the world leaders in such studies. After a brief introduction by Dr. Pamela Wearsch, herself an expert in Mycobacterium tuberculosis, Dr. Yong Song Gho, a professor at POSTECH, Korea, editor-in-chief of the ISEV’s highly successful, three-year-old Journal of Extracellular Vesicles (JEV), and a 15-year veteran of studying exosomes in bacteria stepped to the microphone to describe some of his seminal work in this area. Dr. Gho first described work done by others in the 1960s to identify what were then called outer membrane vesicles (OMVs) that were produced and released by gram(-) bacteria. After their initial discovery, these OMVs were found everywhere there were gram(-) bacteria and that is essentially everywhere. With regard to the function(s) of the OMVs, there were suggestions that they aided bacterial survival, that they played a role in nutrient sensing, that they might modulate the immune response of the host, and that they might also influence the ABC transporter. Dr.
Xandra O. Breakefield (photo), Ph.D., of Mass General Hospital and Harvard University, and a world-leading authority on primary brain tumors, as well as exosomes, presented the Friday morning plenary address to a packed ISEV audience and she did not disappoint. This was the second day of the 2015 annual meeting of the International Society for Extracellular Vesicles (ISEV) (http://www.isevmeeting.org/) being held in Washington, DC, April 23-26. The title of Dr. Breakefield’s presentation was “The Evil Little Things about Cancer EVs As Infiltrators and Informants,” and it was extraordinarily illuminating about both the history of brain cancer research and the emergence of exosomes and/or extracellular vesicles (EVs) as perhaps major players in these grievous maladies. Her talk was briefly preceded by some organizational remarks from Dr. Ken Witwer, chair of the local organizing committee for the meeting, and then some short personal remarks from Dr. Breakefield’s long-time colleague Dr. Fred Hochberg, a prominent neurologist at MGH and Harvard. Dr. Hochberg highlighted Dr. Breakefield’s very special perspective that she can bring to her research as she is a professor in both the Clinical Neurology Department and the Clinical Radiology Department and has spent approximately 20 years focused on clinical medical problems and has an intimate familiarity with medical tools that could be used to examine possible molecular underpinnings of primary brain tumors. With her unusual background, she can bring to bear a remarkable synergy of molecular neuropathology, molecular genetics, and clinical familiarity on the difficult problems she confronts. Dr. Hochberg added that Dr.